The 25th FSA BIKE Festival Garda Trentino came to an end today with the up-and-coming talents scenting some competition air racing the Scott Junior Trophy. 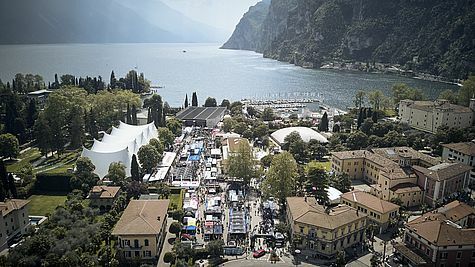 Over the past four days, 45,000 visitors were at site celebrating the festival's jubilee as well as the European MTB scene's traditional kick off event in Riva del Garda – with everything that comes with that. More than 160 exhibitors representing 300 brands capitalised on the biggest consumer outdoor fair to showcase their latest products and developments to an interested audience and make them available for testings. Above that, 3,000 mountain bikers took part in numerous races such as the famous Rocky Mountain BIKE Marathon, the first race of the three-stop Scott Enduro Series or the Ghost City Eliminator, Scott Junior Trophy and Bosch eMTB Challenge supported by Trek. “Thanks to the incredible interest of visitors and participants, the FSA BIKE Festival Garda Trentino is still – 25 years after its inaugural edition – the measure of all things when it comes to MTB fairs in Europe. Exhibitors once again used this international stage to present their latest products. And also the great number of registrations shows that the festival at Lake Garda is not only important for the brands but also for all mountain bike fans,” says Mathias Ley. The CEO of the Hamburg based organising event company Ley Events GmbH also confirmed the date for the 26th event edition. The FSA BIKE Festival Garda Trentino will take place from 3 to 5 May, 2019.